Five years after the sci-fi thriller Kyria 13, German industrial cultists Individual Totem return with a new album, Electrostatic, out September on Toronto-based label Artoffact Records. For a band who, at least according to I Die: You Die, produced an industrial space opera on their last record, Electrostatic is that space opera as played out on a dance floor, complete with literal warriors of the sun channelling Daniel B. and his alien friends. And with interludes that seem to take you into different aesthetic realms, re-listens reveal a shape to the album that is way beyond the sum of its parts. 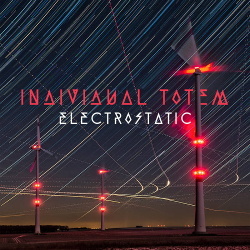 Band founder Bernd Madl writes "Electrostatic takes you on a trip through old school soundscapes as well as hopeful and sometimes forbidden places," but it's hard to know what is hopeful and what is forbidden, because the record is, well, anything but static. From the synth-pop lightness of the opener "Perfect," to the modular experiments that run through the album, to the return to EBM roots on monsters like "Warriors of the Sun" and "Fire," Individual Totem sums up a 20-year career in dark electronic music with a seriously killer record.